Type of figure, which is called hourglass is considered the standard of female beauty: proportional breasts and hips, slender waist and delicious bends of the body. It would seem that women with such a figure are incredibly lucky, what else can you desire? But we hasten to notice that this type of figure is often inclined to completeness. Of course, if the hour glass improves by 1-2 kg, this is not particularly noticeable, because their weight is distributed evenly throughout the body. 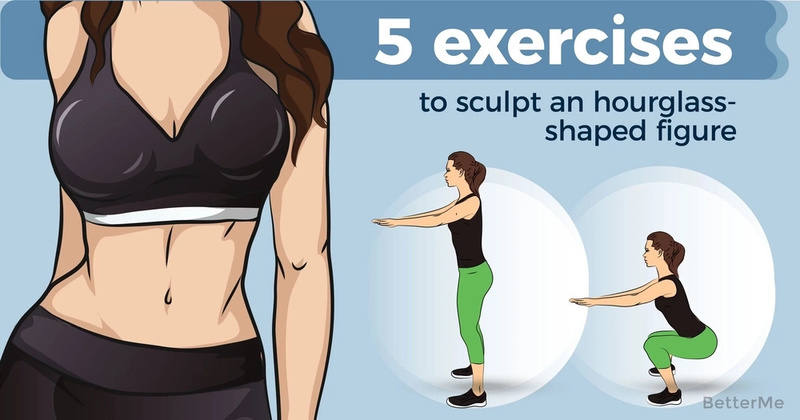 But if extra pounds becomes bigger, then the hips become massive, cellulite is actively manifested, the waist can and will remain fine, but the tummy will start to bulge, and the hands will become full. The right choice of exercises is very important for maintaining harmony. What exercises are better for an X-type figure? As we already mentioned above, with this type of figure, the weight is distributed evenly throughout the body. Therefore, you need to lose weight all over the body, performing exercises for all muscle groups. A good option will be circular training, allowing for 1 lesson to work on the whole body. Choose compound exercises that involve as many muscles as possible. If you belong to those hourglasses, in which the hips are slightly heavier than the top, then cycling, running or walking are especially suitable for you. Such exercises perfectly contribute to burning fat in the thighs, but at the same time help maintain the tone of the whole body.